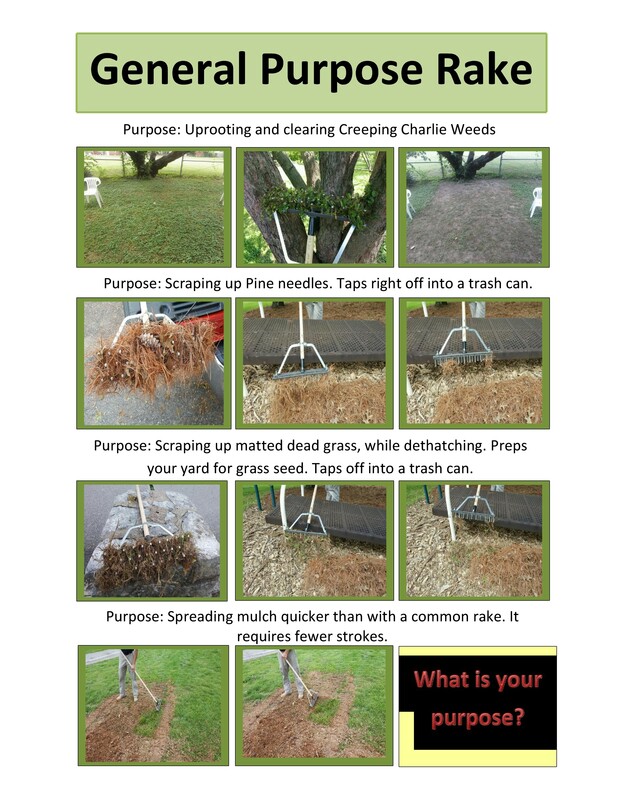 The General Purpose Rake is particularly adept at removing creeping weeds, such as the notorious "creeping Charlie." It picks up pine needles and bumps them off into a waste can. Landscapers say it works well for cultivating mulch and refreshing it. It breaks down clumps of dirt quicker than a traditional rake or hoe. It works as sand rake, particularly for sand-volley ball because it moves so much at once, but still teases out the sand accurately. There are other yet to be discovered uses, but there are surely uses in the agriculture sector.Below is a description pulled from the patent itself.rn"A device is provided for removing vegetation from ground surfaces. The device generally includes a base, multiple tines extending from the base, and a handle coupled to base for moving the base relative to a ground surface for removing vegetation from the ground surface. The tines are arranged on the base in an array comprising at least two rows, where at least one of the at least two rows is offset from at least another one of the at least two rows. In addition, each of the tines has a shaft and a generally rounded head. As such, the tines allow the device to remove the vegetation when operated in a plurality of directions and to improve grasping of the vegetation such that the vegetation may be removed from the ground surface with roots included."